You’ve just had a huge fight with your partner! What do you do now? You’re likely feeling pretty upset and if we’re being honest, you’re partner probably is too. You want the issue resolved but you’re too upset, and you don’t know how to fix it or make things better. Let’s talk about what’s not helpful before getting into what you can do differently next time. It’s not helpful to continue a discussion when one or both of you are feeling emotionally overwhelmed during an argument. How do you know if you’re handling conflict well? Your body sends signals to let you know if there’s distress. 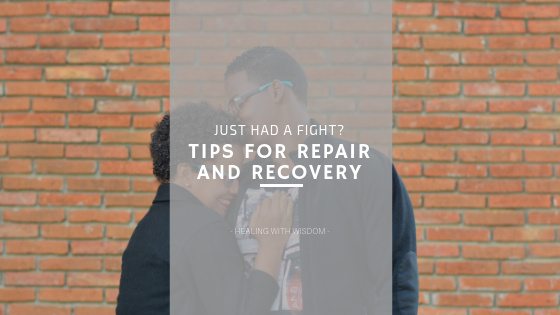 These signals are important because they shape the way you communicate and determine how well you’re able to effectively manage conflict with your partner. Dr. John Gottman (long time researcher of couple dynamics) describes these body signals as a being in Diffuse Physiological Arousal (DPA). It’s essentially when your body goes into fight or flight mode. This happens when you exceed a heart rate of 90-100 beats per minute. Common indicators of DPA include increase in perspiration, increase in body temperature and accelerated heart rate. Elevated DPA directly affects brain function and inhibits the part of the brain responsible for empathy, problem-solving and strategic thinking (all critical skills for conflict management). Make a note of what your body is telling you. Let physiology be your guide and the decisions that follow will help in achieving your desired outcomes. Dr. Gottman’s research has found that the first three minutes of how a couple raises a conflict issue can predict how the rest of the conversation will go. The research has even shown that this can be an indicator of how successful the future of the relationship will be. So, it’s imperative that you maintain awareness of what’s happening and how you’re responding on a physiological level. Taking a break allows both you (and your partner if they need it too) an opportunity to calm down. It takes about 20 minutes for the body to regulate itself (aka for the heart rate to decrease to its normal rate). A general rule of thumb is give yourselves a minimum of 20 minutes before trying re-engage in a discussion about the conflict. Some couples find more success with allowing more time than 20 minutes and take as much as 2 hours which is fine. The key is to decide on a plan to re-visit the discussion when you are both feeling calm. Engage in self soothing practices or other types of activities that encourage more pleasant feelings. During the break period (for whatever pre-determined length of time), don’t focus on what the conflict was about. This only allows you the opportunity to replay it in your mind, focus on regrets of what was said (or not said) and neither of which are helpful. Doing this prolongs the state of DPA which is counterproductive. It’s usually not the fight that’s the problem but HOW you fight. Successful outcomes depend on how effectively flooding during conflict is managed. How do you manage flooding in your relationship? I’d love to hear your questions and comments!